We have a 24 hour cancellation notice from the time of check in (14:30) - failure to do so will result in the first night stay being charged. Group reservations for 6 persons and above may have a different policy depending on the number of persons staying and the time of year. These terms are applicable to all reservations, bookings and agreements for accommodation of any kind made by (“the Customer “) and The Abbey Court Hostel Limited. Once a booking has been accepted by Abbey Court, a contract exists between the Customer and Abbey Court and making a booking by the Customer indicates acceptance of these Terms and Conditions by the Customer. For group bookings different policies and additional supplements will apply, and the customer will be contacted by Abbey Court with more information. These Terms and Conditions may be subject to change at any time and without notice. Prior to your check-in, please consult the website for the most up-to-date amendments. Use of this website, is subject to the terms and conditions outlined below. By using this website the Customer agrees to be legally bound by these terms and conditions. This website is created and maintained in Ireland. Care has been taken to ensure the information provided in this website is accurate and complies with Irish laws & regulations. Links that feature on the websites include links to other sites which we believe may be of interest to you. By providing these links we are not endorsing or recommending such sites or the services or material provided by them. We therefore accept no responsibility for the content of these sites. All rates quoted are subject to availability and alteration. All discounted rates quoted are limited offers and subject to availability and may be subject to a minimum night stay. While every effort has been made to ensure the accuracy of all information, Abbey Court does not accept liability for any errors or omissions and reserves the right to change information and descriptions of listed accommodation and products. The website is intended to assist the consumer in determining the availability and booking of accommodation. Apart from printing information in connection with your travel, you are not entitled to reproduce, replicate, sell, resell or otherwise exploit the website unless we provide you with prior written permission to do so. Use of the website is restricted to people over the age of 18, who can enter into binding contracts. Please note that different terms, conditions & cancellation policies may exist in relation to online bookings made via Booking Agents and affiliate websites depending on the accommodation or rate type selected. Please read carefully the apartment and hostel accommodation rate details that are provided before you make your online booking. Except in the case of Guests that avail of “Prepay and Save rates”, Guests will be asked for full payment of the balance on arrival, in cash or by using their credit or debit card and verification with the latest “Chip and Pin” technology. Depending on accommodation selected, guests may also be asked to pay a Security Deposit on arrival by pre-authorisation of their card. (see section below on Security Deposits).Customers availing of our discounted “Prepay and Save” rates avail of our best discounted prices at the time of booking. Prepayment in full is required at the time of booking and all payments are non-refundable. As a security measure “Prepay and Save” customers and customers who have booked through 3rd party agents and prepaid in full will either be required to pre-authorise their credit or debit card and to produce a valid ID on arrival. Abbey Court accepts all major credit cards and debit cards. Abbey Court does not accept cheques unless previously agreed with Management. Cancellation of a reservation will be effective only from the time of receipt. Cancellations must be made by e-mail. Confirmation of cancellation will then be sent to you. If you do not receive confirmation, then your cancellation may not have been received. It is the Customer’s responsibility to ensure proper receipt of their cancellation In the case of Apartment accommodation, cancellations must be received 14 days prior to arrival date for bookings made via any third party channel. Cancellation of hostel accommodation must be made not later than 24 hours prior to arrival. Later cancellation will incur a cancellation fee of not less that the full amount of the first night’s accommodation charge. We strongly recommend that all Customers obtain appropriate travel and personal insurance cover. 1. Deposits paid (Prepay and Save) are non-refundable. 2. Apartment cancellations must be received by email at least 14 days and hostel cancellations at least 24 hours before the arrival date, to info@abbey-court.com or to the cancellation address provided on the website through which the Customer’s booking was made. No further charges will be made for cancellations made prior to the deadline, other than the loss of any deposit paid. 3. If a customer fails to arrive or tries to cancel within the appropriate period before their due arrival date – they are treated as a “No Show” and the full amount will be charged and is non-refundable. 4. Cancellations are not permitted on “Prepay and Save” rates, as the full cost including any extra services are charged at the time of reservation. If you cancel for any reason or attempt to modify the reservation or do not arrive on your specified check in date, your payment is non-refundable. 5. The Customer agrees that the above cancellation charges are a fair and genuine estimate of the loss that Abbey Court would incur on the cancellation of a booking. Bookings made through other sources including online travel agents, tour operators or other websites may be subject to different policies. Please refer to your confirmation for details. Whilst all reasonable efforts have been taken by Abbey Court to ensure that bookings made under this Agreement are able to proceed, we reserve the right to relocate any booking to accommodation of similar size and standard in the locality. The Customer acknowledges that Abbey Court accepts no liability for any loss or damage suffered by or caused to the Customer as a consequence of the relocation. In exceptional circumstances Abbey Court may find it necessary to cancel your booking. If this occurs Abbey Court will refund any sum the Customer has paid which shall constitute a full and final settlement of any liability Abbey Court may have to the Customer as a result of such cancellation. Abbey Court will not be liable for any delay, loss, damage or expenses incurred if your booking needs to be altered or cancelled, if it is unable to perform its contractual obligations as a result of events beyond its reasonable control, which shall include but not be limited to events such as war, civil strife, terrorist activity, labour disputes, natural or man-made disaster, fire, flood, and adverse weather conditions. If a Customer wishes to alter their booking (e.g. change the dates of stay or the accommodation requested), Abbey Court cannot guarantee that it will be able to do so and it accepts no liability for any loss, damage or additional expense that may be incurred in these circumstances. While amendments are not permitted with Prepay & Save Rates, they are possible with Standard bookings depending on availability, if requested at least 14 days prior to arrival. Additional costs may be incurred if the cost of accommodation on the new nights varies from the previous booking. All amendment requests must be received in writing. Abbey Court reserves the right to charge a Security Deposit upon check-in. A charge of €200 per apartment is applicable. Please be advised that only credit/debit card pre authorization payments can be made in respect of the apartment security deposit, which will be the responsibility of the lead guest. Individual per person payments are not permitted and the lead guest will be responsible for the conduct of the occupants. Where damage or disruption occurs Abbey Court reserves the right to withhold some or all of the security deposit of the lead guest (see below). Groups of 6 or more persons using the hostel must pay a fully refundable deposit of not less than €30 per person prior to check in. The payment will be used to cover incidental items including, but not limited to, breakages, damage to property, additional cleaning costs due to the accommodation being left in an unacceptable state, excessive electricity usage, and breaches to regulations such as smoking (other than the designated areas) or causing disturbance of other guests enjoyment of the property. Security Deposits may also be used by Management in the event of unauthorised extra guests using the apartment and facilities. Security Deposits held on a credit card (via a pre-authorisation) or charged to a debit card will be refunded as per the issuing bank’s policy. Typically this may take between 3-10 working days; however some banks do take longer. Customers should note that with pre-authorisation no money is transferred at the time, but it will affect your available funds balance and spending limits on the card while the pre-authorisation exists. Abbey Court is not liable for any delays in refunding pre-authorisations by credit card companies. If disturbance to other guests has occurred or any damage to the property, the cost to Abbey Court will be retained from the Security Deposit, and only the balance returned to the Customer. If this cost exceeds the value of the Security Deposit, the Customer agrees to indemnify Abbey Court for the damage, additional cleaning costs or other charges and agrees to pay all costs of recovery including all legal costs, and other expenses. The Customer hereby gives consent to Abbey Court to apply to the Customer’s credit card all reasonable charges incurred which may not be covered by the Security Deposit. Customers must comply with Abbey Court’s rules for checking-in and checking-out. Unless otherwise agreed in advance, apartments and hostel accommodation will usually be made available from 14:30 on the day of arrival. All guests must have a valid photo identification to check in. Unless otherwise agreed in advance, all accommodation must be vacated and all keys or entry cards returned by 10:30 am on the day of departure. Should keys be lost or stolen or where the Customer fails to checkout by 14:30 on the date of departure, the Customer will be liable for the full cost of an emergency locksmith. In the case of the above Abbey Court reserve the right to remove a guest’s belongings from the apartment or hostel room and accepts no liability for the loss or damage of these items. A fee of €200 will be charged for keys not returned within 24 hours of the departure date and it is agreed by the Customer that Abbey Court at its discretion may apply this charge to the Customers credit / Debit card or deduct it from the Security Deposit. All apartments come fully furnished and include a kitchen equipped with appliances, cutlery, crockery, and kitchen utensils. Food or drinks are not provided as part of the product offering. No items may be removed from the apartment. All apartment prices quoted are inclusive of bed linen & towels, and Internet. Each apartment is allocated an electricity allowance and excessive use of electricity will result in a surcharge being applied to your bill. Please ensure that all appliances, lighting, heating, hot water etc are turned off unless required. Hostel guests have full access to all of the hostel facilities during the times that these facilities are open. Unless negligence by Abbey Court is established by an independent body or a Court of law, Abbey Court will not be held liable for injury to person, loss of, or damage to any property of any Customer or person staying at or visiting the apartments or hostel and or its general facilities and area. We strongly recommend that guests make their own arrangements for travel & motor insurances to cover any such losses. The Customer is responsible for taking reasonable care of the apartment or hostel accommodation and its contents while staying with Abbey Court. The apartment, hostel accommodation and all equipment, utensils, furniture etc. must be left clean and tidy at the end of your stay, or charges may be applied. Customers are reminded to lock apartments and hostel room doors and close all doors and windows when leaving the apartment or room. Except in the case of normal wear and tear you are responsible for any damage to the apartment or its contents during your stay which has occurred due to the negligence, willful default or irresponsible behaviour on the part of yourself or those occupying the apartment or their guests. Any damage must be reported to Management without delay. The use of any Abbey Court Property for the purpose of conducting business of any kind, without the consent of Abbey Court Management, is expressly forbidden. The Customer shall do nothing in the accommodation which is a breach of the law. The Customer shall not at any stage cause a nuisance of any kind or behave in an anti-social manner to fellow guests or staff members. Abbey Court grants the use of its property solely for appropriate, legal, personal use. Abbey Court expressly forbids entry to its property to any persons other than those listed under the relevant booking. Abbey Court and the Customer agree that no tenancy rights accrue as a result of the usage of property. The Customer may not re-let/sublet the apartment to any other third party. Abbey Court reserve the right to refuse a Customer entry and accommodation if, on arrival Management reasonably considers that the guest is under the influence of drink or drugs, is unsuitably dressed or is behaving in a threatening, abusive or otherwise unacceptable manner. Abbey Court operates a strict No-Party policy. The maximum number of people per apartment or private or dormitory room should not be exceeded and noise levels must not cause a disturbance to other guests. Additional charges will be levied on a Customer’s account if there is evidence of a party having taken place. The maximum apartment occupancy is set out on your booking confirmation. Guests shall comply with all reasonable rules and procedures in effect at the property, including but not limited to health and safety and security procedures and requirements as to registration.If during the course of a stay, Abbey Court receives serious complaints about the Customer or the Customer is behaving in a manner detrimental to the enjoyment of other customers or their guests, or the Customer is in breach of the Terms and Conditions, Abbey Court reserves the right to terminate the Customers stay without notice and without any obligation to refund any monies. All Abbey Court apartments are by law non-smoking properties. A charge of €200 per night will be applied in the event smoking has occurred in the apartment. Use of candles or any naked flames in the apartments are strictly prohibited. The Management and its authorised personnel may at any time access the apartment or any other hostel accommodation for the purpose of inspection of the apartment, and to carry out repair or maintenance work. Abbey Court warrants to use all reasonable efforts to ensure that the Customer’ chosen accommodation is properly arranged and is of a good standard. If not happy the Customer should immediately notify Abbey Court of any complaint, and in any event no later than 12 hours after your arrival. If Abbey Court is found to be in breach of this warranty and cannot rectify the problem, Abbey Court will at its option either provide you with a replacement apartment (if reasonably practicable) or a partial refund of the price paid.Under no circumstances shall Abbey Court’s liability to the Customer exceed the amount paid to it for the rental period. Guests under the age of 18 years must be supervised by at least one adult per apartment. The lead guest will be responsible for the conduct of the remaining guests and will be required to provide a security deposit for the group. Guests under 18, using hostel accommodation [other than private rooms] must be accompanied by an adult and cannot under any circumstances share accommodation with others in a non-private or dormitory room. Children under the age of 2 are free and do not count as occupants. This is however dependent on suitable apartment availability and all local fire regulations. All children over the age of two are regarded as adults when determining occupants of an apartment.Abbey Court reserves the right to charge for the provision of children’s equipment including cots and high chairs. Children under the age of 14 must be supervised by an adult at all times. No pets, of any kind, are allowed in the apartments or hostel with the exception of service dogs. These terms and conditions shall be interpreted under Irish law except as otherwise provided by convention or applicable law and shall be subject to the jurisdiction of the Irish Courts. These terms and conditions are applicable unless they are inconsistent with the applicable law in which event the applicable law shall prevail. If any of the provisions of the terms and conditions are invalid under any applicable law, then the other provisions shall nevertheless remain valid to the extent that the remaining provisions are capable of standing without the provision or provisions ruled invalid. 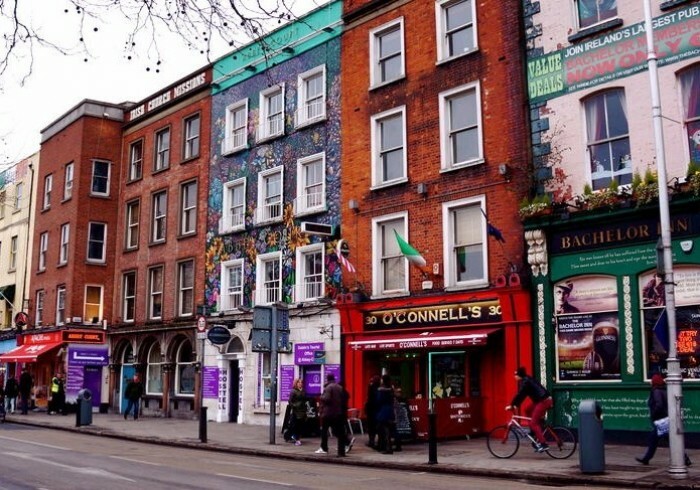 The Abbey Court Hostel, part of 'Dublin's Best Hostels', is famous for its excellent location, brilliant facilities, warm atmosphere, friendly staff and competitive prices. The hostel has been operating successfully since its establishment in 1999, and continues to see thousands of satisfied guests coming and going year after year. Abbey Court has won the Hostelworld HOSCAR award for the 'Most Popular Hostel in Dublin' for the last two years and this year was voted as the 2nd Best Hostel IN THE WORLD for groups by Hostelworld. We have en-suite dormitories ranging from four to twenty-four beds, as well as private rooms and apartments. We offer complimentary buffet breakfast, luggage storage facilities, lockers in the dorm rooms (bring your own lock! ), free Wi-Fi , maps and city guides, a self-catering kitchen, and best of all, free guided walking tour of the city every morning. We also run an infamous nightly pub crawl. There are extra showers and toilets on each floor, plus self service laundry facilities and a smoking area. We have 24 hour reception, a BYOB bar area as well as a games, TV and computer room.